Mim say Hello and needs some advice. Guess who contact me out of the blue: Mim's mom! It has been a long time since I have heard from Mim or her family. She sounds like she is doing alright. Her mom says "She is the sweetest little girl and people love her and she likes people too!". Mim's mom also says Mim is "very intuitive and if I get upset she will come and sit beside me and kiss my ear". Awe, what a lovely Havanese Mim is. Thank Mim's mom for sending in and sharing a photo of Mim. I love hearing from Caillee's puppies. From what I understand Mim's other four legged family members are no longer with them. Mim's mom says Meeko died when he was only ten years old and they lost Mercedes last year. So sad. I miss hearing stories from their home about the three fun-loving Havanese. 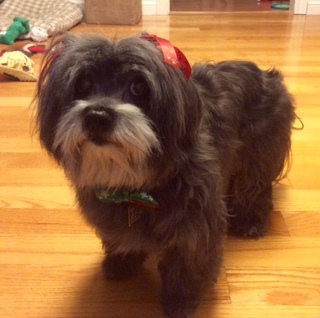 A Havanese named Mugsy has managed to crave a spot in their hearts. I look forward to hearing stories about Mim and Mugsy! Maybe a photo or two? Fingers crossed. Mim's mom was saying she couldn't believe Mim will be five years old this coming August… If she will be turning nine… that would mean my Caillee, Mim's doggie mom, will be turning 11 years old in very April. Wow, how time totally flies by! Mim's mom tells me Mim took over an old-pink-dog toy that once belong to Meeko. She loves this little dog and it has become "thread bare". Mim's mom is in a dilemma about the old-pink-dog toy. You see if Mugsy, her new four-legged family member gets a hold of the toy, Mim goes all over the house looking for her toy. Mim's mom has tried giving Mim other toys, and new toys, but Mim will have none of them. She has asked for some suggestions. I understand this sort of dilemma. Oliver, Mim's half-brother, has a favourite toy. Well, he had a favourite toy which fell completely apart from pour enjoyment. First the squeaky died, it was a quick death, and then the whole stuffed toy seem to fall apart. This particular toy had seen more time with a thread and needle than I think any other toy has ever in our home. I sometimes would hide the toy and only leave one other toy out to play with. It was a similar toy, not the same in any way other than it was stuffed and had a squeaky. He played with that and as more toys came out except for the original favourite toy, it was eventually his favourite toy. I eventually had to throw out the original favourite toy because it did completely fall apart at some point. That is what I did in a similar situation. Perhaps you have a better suggestion to share?